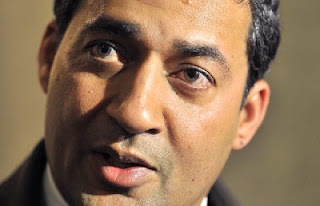 Calgary Rants: Hey Dr. Raj Sherman....Stop Calling My House! Hey Dr. Raj Sherman....Stop Calling My House! Do you know what annoys this blogger more than telemarketers? Unsolicited phone calls from Alberta Liberal Party leadership candidates. I have received three automated calls from Dr. Raj Sherman in the past few weeks, and it is really starting to get on my nerves. The call is awkward at best, with Dr. Sherman stuttering about being your leadership choice, yadda yadda yadda. He then prompts you to push button 3 to register as a supporter ( which I wonder if the ALP is using towards their inflated "supporter" numbers.) and goes on and on about how you don't have to really support the party or buy a membership ( to paraphrase) in the party. The only thing missing is a promise that your support will be kept strictly confidential and hey, "no one will ever know." ( Promise the doctor! ) It is simply disgusting. The call is poorly done at best and very annoying. What makes me laugh is the fact he really is barking up the wrong tree. Either he is using poor PCAA membership lists or a piss poor predictive dialer. I would never vote Liberal, so his computer simply has it all wrong! If random calls from controversial doctors are your thing, then you will likely enjoy the call. I think Raj is probably a nice enough guy and all, but from now on, this cowboy will be watching the call display from now on. We, too, have received multiple calls from Sherman. Agree as to the form and substance of the call. And Raj. . . Try calling ALP members, personally, instead of using a poorly executed recording to your highjacked PC list. Calling all the ALP members would take only a couple of hours. . . I think he knows that the PC membership is more likely to vote for him than the ALP membership. If I were a PC partisan, I would vote for Raj Sherman, knowing that none of the other candidates (except maybe the one endorsed by Craig Chandler) would sink the Liberals quicker. If that party wants to become a provincial laughingstock, they're going about it the right way. Great blog! Speaking of the candidate being endorsed by Craig Chandler...aka Ted Morton, he has been crank calling my home at all hours and then hanging up when I don't answer, rather than leaving a message. I have never had a PC membership, (never saw the need before and right now I don't know who to vote for anyway) so where is he getting his lists? Wait...Chandler is notorious for using lists he's not supposed to. (He'll do anything to win!) So, I guess I just answered my own question. Anyway, I keep waiting for you to post some blogs on the PC leadership candidates but you've remained eerily silent! What gives? Thanks for the comments. Anon 8:53am- I have not had much time to blog about anything ( I hate when work takes away from my blogging time!) and thus the lack of PC Leadership posts. Joey over at the Enlightened Savage blog has some great updates on this. I am trying to do some video interviews with the candidates, so stay tuned! Okay, for everyone who accuses the PCAA of playing fast and loose with their membership lists, they don't. Only Presidents get the membership lists, and only for their own constituencies. They can designate one other person to get the list, usually the VP Membership. Sure, they may hand those around, but the Party itself has very strict rules about who can have lists. So, maybe you were on a 2006 leadership list, and there are runmours that those got handed around pretty frequently. As for Anon at 8:53, there are companies that compile and sell lists. The federal Conservative Party, in addition to their own membership lists, buys lists from those companies, and I can only assume that the leadership candidates for the various parties are also buying lists, and perhaps some of the rest of you receiving calls are on other lists. i just want to defend my former staff, and the current Executive Director, none of whom would ever give lists to people who weren't authorized to have them, especially the good doctor. Thanks for letting me rant, Shane.